Home » car » colouring contest » creative » Facebook » Food n Beverage » photo » purchase » spend » travel contest » LEXUS Little Moments Bond To Menang Contest: Win Honda City, Staycation & more! 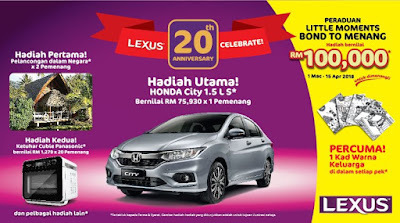 LEXUS Little Moments Bond To Menang Contest: Win Honda City, Staycation & more! First Prize x 2: All-In Staycation each. Second Prize x 20: Panasonic Cubie Steam Convection Oven worth RM1,279.00 each. Consolation Prize x 100: Online Voucher worth RM20 each. Bonus Prize x 20: FujiFilm Instax Mini 70 Camera each. Purchase any LEXUS 20th Anniversary pack (190g/200g/400g/456g) from any supermarket or store within Contest Period. Colour the LEXUS 20th Anniversary colouring card in pack with their child. Snap a photo of themself together with their child posing with the colouring card in the most creative way and upload/share it on their Facebook. Hashtag their most creative photo with #Lexus20 and set their Facebook post to Public to qualify for the contest. One (1) receipt entitles contestant to one (1) online participation. Snap a photo of themself and their child posing with their complete Lexus Anniversary Logo. Upload/share it on their Facebook and hashtag it with #Lexus20bonus and set their Facebook post to Public to qualify. 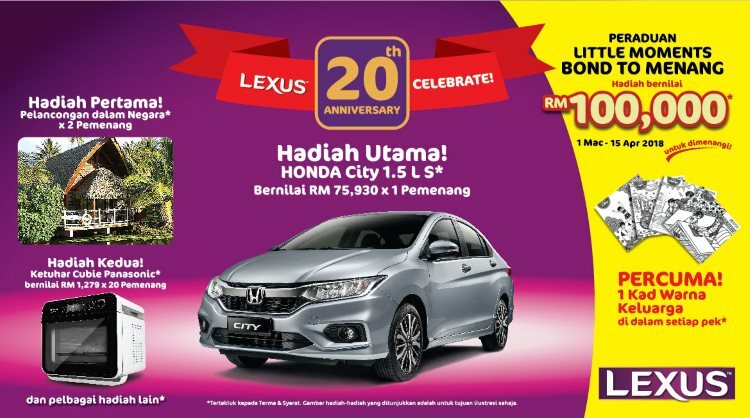 Visit LEXUS Litte Moments Bond To Menang Contest terms & conditions for more details.